The Franca apartment is immersed in the wonderful surrounding Mediterranean nature, beautiful panoramic views, in a quiet area, the beach easily reached on foot in just 10 min. The best local restaurants are nearby. 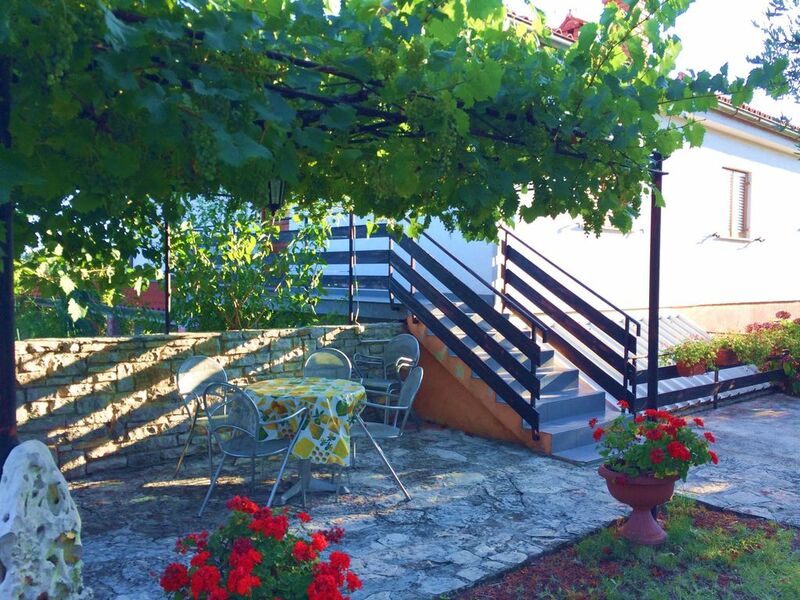 You will like my accommodation for the views, fresh vegetables directly from the owner's garden and intimacy. Suitable for couples, solitary adventurers, families (with children) pets are welcome with extra charge payable on arrival. It has a double bedroom with armchair and wardrobe, living room with sofa bed, dining area with table and 4 chairs and kitchenette, exit to the balcony with a wonderful view of the surrounding countryside, flat-screen satellite TV, free Wi-Fi internet connection, bathroom with shower, hairdryer, bidet and washing machine. Near the house on the ground floor the private terrace surrounded by greenery with garden furniture. Private parking near the house. The ideal accommodation to spend a holiday in complete relaxation and comfort. The town of Savudrija, rich in pine trees, is also known as an excellent area for the treatment of the respiratory tract. * Customers are asked to use appliances with care. * Any damage caused will be charged on the spot. My family and me had an amazing stay in a lovely apartment called Franca. It was very plesent and quiet with all the privacy needed, just perfect for a family vacation! The family Makovac were friendly and helpful. All in one a real 5 star stay! Thank you lucy for the nice review, hope to see you in the future. Sehr schöne große Wohung in guter Lage am Olivenhain. vielen lieben Dank fuer Ihre schone Bewertung und fuer Ihre Aufenthalt bei uns. Sie sind immer willkommen bei uns. La ringraziamo per la recensione e per il soggiorno da noi. Supplemento da pagare all'arrivo: 1. Registrazione 7 € per persona solo il primo giorno 2. Animali domestici 10 € per animale per notte / permesso massimo un animale domestico) Si pregano i clienti di usare gli elettrodomestici con cura. I danni eventualmente causati verranno addebbitati in loco.